Leon Drury is the Chair of the Textiles, Clothing and Footwear Industry Reference Committee. 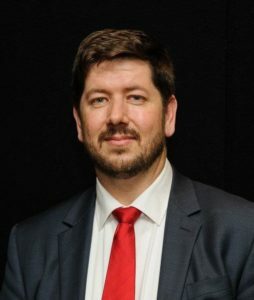 He is Executive Officer for the Manufacturing Skills Australia NSW Industry Training Advisory Body. In this role, Leon represents a range of manufacturing industries and provides advice on their behalf to the NSW State Government. I started my working life as an apprentice carpenter but I found myself drawn to the opportunities offered by the Defence forces and joined the Navy. I continued my apprenticeship training but as a boiler maker and went on to serve in Iraq during ‘Desert Storm’ operations in the early 1990s. After leaving the Navy, I spent ten years at Boeing in the composite materials and manufacturing space and gained recognition of prior learning for a Certificate III in Sheet Metal. I joined the Australian Manufacturing Workers Union and was involved in the TAFE NSW Accreditation Council before working for a Registered Training Organisation (RTO) conducting workplace assessment, linking pay scales to awards and competencies in the workplace. In 2010, I was appointed as the Executive Officer at the NSW Industry Training Advisory Body and now spend most of my time consulting with industry about their workforce development and Skills needs and how these are impacted by changes in technology. Put simply, Vocational Education and Training creates opportunities. There are intergenerational benefits that come from having nationally recognised qualifications which not only improve people’s wealth but support the betterment of families. For someone who didn’t finish high school, I’ve been learning ever since and am a huge advocate of lifelong learning. Vocational Education and Training has given me opportunities and a pathway to success. There are many examples in industry of people who have succeeded despite not achieving high grades at school, such as Gerry Harvey and Lindsay Fox. I’m seeing a number of things that will impact the industry in the near future. There is a shift from mass production to bespoke manufacturing in everything from clothes through to industrial products. Consumers now want to put their own fingerprint on the things they buy and want to be involved in the design process. Sustainability’s importance in relation to ethically based sourcing and locally based manufacturing continues to grow. The use of ‘Brand Australia’ will be vital for the future of the Textiles, Clothing and Footwear industry in particular. There is also a focus on upcycling and recycling. There is a large consumer shift toward understanding what we do with all the garments, furnishings and finishings in our home and how they can be remanufactured or re used for different purposes. Design is the first thing that comes to mind and everyone is currently focused on the importance of designing goods which are tailored and sustainable. As you would expect there is a need to increase skills around the application of new materials incorporating technology and high-performance fabrics, for example specialised textiles that can be both water repellent and provide an electrical sensing property. There is also a need to skill people in the application of additive manufacturing techniques such as 3D printing and robotics. Alongside this, is the importance of data collection throughout the manufacturing, supply chain and retail process to align products to customer needs. In the past the focus has often been on the economics of VET rather than the outcomes and social sustainability it delivers. We need to reduce system complexity and shift the focus to learners and workers and what skills/recognition they need to be able to progress their careers and make industry more sustainable.